1700 The BBC is discontinuing this live update page. For the latest developments, please go to our main news page. 1658 Russian President Dmitry Medvedev has laid a bouquet of red roses with a black ribbon on the platform of one of the metro stations where a suicide bomber killed dozens of commuters during Moscow's morning rush hour, the Reuters news agency reports. International condemnation has been pouring in and Russia's leaders have vowed to "destroy" those responsible. 1645 Sergei Markov, a member of the Public Chamber of Russia and an elected member to the State Duma described the mood in Russia to BBC's Europe Today programme: "Now of course people are shocked and depressed and the traffic jams are smaller than usual because the TV authorities repeatedly appealed to citizens to stay at home." 1640 The English-language website of Russian news agency RIA Novosti has published this report of the attacks based on eyewitness accounts. But commuters have also been posting their videos and pictures online and the New York Times newspaper has a summary of these. 1620 Gennady Zyuganov, head of the Communist Party of the Russian Federation tells the Moscow-based Ekho Moskvy radio station that "terrorists" should be given the death penalty. 1609 Live footage has just come in showing President Dmitry Medvedev going underground to inspect the damage caused by the blast at the metro station beneath the headquarters of the Federal Security Bureau (FSB). A BBC World Service listener from St Petersburg emails: "We should deal with the reason, not the consequences. And the reason is the North Caucasus, wild and unknown, which lives by its own laws and which we, ordinary Russian people just don't need at all. 1555 UN Secretary General Ban Ki-moon condemns the attacks that have killed at least 38 and injured more than 70 people in Russia and says he is confident the "perpetrators of this heinous terrorist attack" will be brought to justice. 1550 The UK's Guardian Newspaper has an article by Russian academic Irina Filatova who lives next to the Park Kultury underground station - one of those targeted. She says the choice of stations for attack was "a gauntlet on the ground". 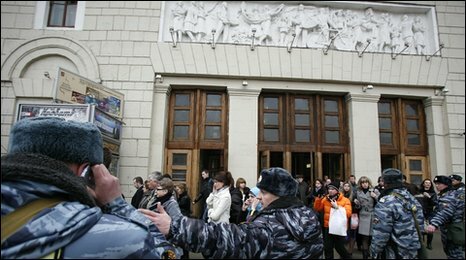 1525 The BBC's Jonathan Charles in Moscow says listening to the radio, people seem to very calm but some websites have criticised the government. But, he says, since the government controls most of the media in Russia, a very measured message will be getting to most people. 1520 Analysts will keep a close eye on Russia's response to the attacks. The Reuters news agency quotes Jonathan Eyal of the Royal United Services Institute: "This is a direct affront to Vladimir Putin, whose entire rise to power was built on his pledge to crush the enemies of Russia." 1510 Authorities in Baku in Azerbaijan and Kiev in Ukraine step up security following the attack. Vladimir from Kaliningrad emails: "Some people here talking about leaving Caucasus and putting a wall around it. Yes it's not a bad idea, but Caucasus is our way to Asia where there are lots of minerals. So leaving Caucasus would be losing out both in terms of strategy and in terms of economics." 1450 Boris Nemtsov, former deputy prime minister and a leader of the Russian democratic opposition movement Solidarity, writes of his sorrow over the attack on his Livejournal blog. A statement by the organisation says a change of policy over the Caucasus region is the only way to stop such acts in Russia is posted on the same blog. 1440 Russia's Itar-Tass news agency quotes Chechnya's President Ramzan Kadyrov as saying that Chechen authorities are ready to help with the investigation. "Any order will be fulfilled promptly," he said. 1427 Mark from Russia emails: "I don't think that for many this tragedy was completely unexpected. My condolences to the wounded." The authorities are reacting at the speed of a diplodocus." 1405 Service has resumed on the Metro line targeted in Monday's attacks, local media reports. Itar-Tass quotes a Russian Emergencies Ministry source as saying traffic had resumed on the route, although trains were not stopping at Lubyanka station. Global Voices online has collated and translated material from Russian bloggers about the bombings. These include pictures from inside the stations, video and eyewitness reports. It also provides links to Russian-language live update pages. 1350 After reports of Moscow taxi drivers putting up their prices in the aftermath of the attacks, Russian Prime Minister Vladimir Putin calls on businessmen working in the transport sector not to cash in on the tragedy, RIA Novosti reports. "I ask you not to abuse this situation, inflate prices or create additional difficulties, but to express solidarity with those in trouble and in need of your support," he is quoted as saying. 1340 Lord Frank Judd, who recently visited Chechnya as part of a human rights fact-finding mission for the UK parliament, tells the BBC World Service that human rights are key. "The attack today was wicked, cruel and cannot be in any way excused... If the human rights situation is bad, the opportunity for terrorists to operate and to win new recruits is greater." 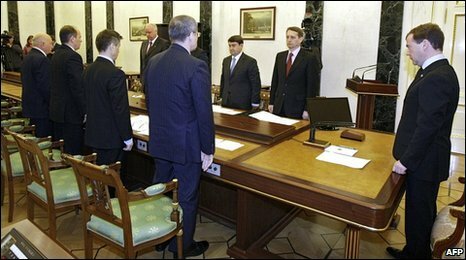 1325 Andrei Klimov, deputy chairman of the ruling United Russia party, tells the BBC World Service: "Usually before spring, these terrorists try to do something to attract the attention of their sponsors and world newspapers. It is very expensive to stage such attacks and they need money for that. We know there are people who pay them this money from abroad." Elena from Moscow emails: "Every one of us could have been there in that carriage and it's so terrible that the second blast couldn't have been prevented...But I myself look Mediterranean, and am now not only scared of terrorists but also of my co-citizens." 1314 The New York Police Department increases security on the city's subway system as a precaution following the Moscow metro suicide bomb attacks, the AFP news agency reports. 1310 Russian news agency Interfax says that Russian police have CCTV footage of both bombings. 1305 Georgian ruling party MP Giorgi Gabashvili condemns the Russia attacks in an interview with Georgian Public TV but says Russia's policy in the Caucasus has fostered an environment of violence, terrorism and instability. 1300 The head of the Federal Security Service, Alexander Bortnikov, has said that the two female suicide bombers are believed to be linked to militant groups from the predominantly Muslim North Caucasus region of Russia. Galina, 69, from Kolomna, emails:"I think that our police force and the FSB [Federal Security Bureau]are off their guard. Where are our intelligence services, what are they doing? I understand their job is very hard, but it is their job! 1240 Russia's ambassador to Nato, Dmitry Rogozin, says the suicide bombers are not "martyrs" and should not be described as such, the Tas news agency reports. 1233 Alexander Pikayev, military expert with the Committee of Scientists for Global Security, says the bombings could undermine the credibility of Russia's leadership. He says it shows that efforts to stabilise Chechnya and the North Caucasus may not have been enough. Yevgeny from Moscow emails: "It's a complete failure of FSB (Federal Security Service) and of the Ministry of the Interior! The president now has to make his own conclusions. I'm asking everyone to stay calm and vigilant. That's the best that we can do right now." Vladimir Putin: "Extra measures are being taken to ensure security"
1218 Mihai Makarenko from Lviv in Ukraine emails: "As soon as the Ministry of the Interior and the Federal Bureau of Investigation (FSB) start undertaking harsh measures to prevent such acts of terror, human rights activists and other pseudo-democrats start complaining about authorities' arbitrary rule. The FSB should stop looking at the West and use Israel as an example instead." 1216 nlupus tweets: "Please support Russia! March 30 is a national Day of Mourning for terror attacks victims." 1211 Leonid from Russia emails: "It's a real tragedy and it shows us once again that terrorism today is not a local problem of just one country. It's a global problem. And we can get rid of this threat only together. Because while some are fighting terror and others are inciting it, there won't be any result." 1152 UK-based Russian affairs commentator Andrei Ostalski says the attacks could lead to a "widespread panic... and the society will react in a way which will allow those who actually favour tightening up the screws in Russia again to push ahead with this". 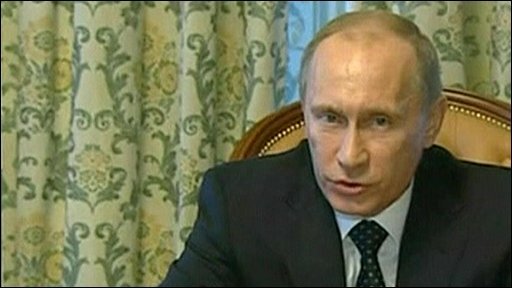 He adds that Vladmir Putin's response could improve his chances of taking back the presidency in 2012. 1138 Agnes from London emails: "Why in the world wasn't the Metro shut down after the first blast? I was somewhere in the Tube during the London bombings and it was shut down within half an hour." 1132 UK Prime Minister Gordon Brown is appalled by the attacks and says such acts could never be justified, his spokesman says. Mr Brown has sent a message of support to Russia. 1130 Russian PM Vladimir Putin is cutting short his trip to Siberia and returning to Moscow in the aftermath of the Metro attacks, his spokesman says. 1124 Henry Wilkinson from Janusian Security Consultants says it is highly likely the attacks are the work of the Caucasus Emirate network which is battling for an Islamist state in North Caucasus. 1123 Galina Yemelianova, a lecturer in Russian and East European Studies at Birmingham University, says suicide is against Caucasian tradition but its use shows jihadist influence on North Caususus insurgent groups, Reuters reports. 1117 The head of the Russian Orthodox Church, Patriarch Kirill, urges Russians not to panic and instead join efforts to stop terrorism, Russia's Tas news agency reports. 1107 US President Barack Obama condemns the twin blasts as "outrageous acts", adding "the American people stand united with the people of Russia in opposition to violent extremism and heinous terrorist attacks that demonstrate such disregard for human life". 1103 Sean, the author of Sean's Russia Blog writes: "I'm sure the Russian government will take some heat, and perhaps deservedly so since the North Caucasus continues to be an increasing mess. Thus, six years of a terror free Moscow has officially ended." 1051 Mr Putin, speaking during a conference with senior emergencies officials in Krasnoyarsk, says the attack was a "a crime that is terrible in its consequences and heinous in its manner... I am confident that law enforcement bodies will spare no effort to track down and punish the criminals." 1044 Russian Prime Minister Vladimir Putin has vowed that the "terrorists" behind the attacks will be "caught and destroyed", Russian media report. 1026 The BBC's defence and security correspondent, Nick Childs, says: "This will be a considerable embarrassment for the authorities in Moscow, who have been declaring success in their campaign against militants and separatist movements in the North Caucasus. But there had also been concerns that violence could return to Russian metropolitan areas like Moscow. A bombing on a Moscow-St Petersburg express train late last year, which left more than two dozen dead, was blamed by the authorities on Islamist militants." 1018 The BBC's Richard Galpin in Moscow reports that Doku Umarov, a self-proclaimed Chechen militant leader, posted an internet video warning of potential attacks in Russia last month. 0959 Prosecutors say they may have already found the remains of the woman suspected to have carried out the second attack at Kultury Park station. 0950 Jonathan Eyal, of the Royal United Services Institute, says the attacks are a "direct affront to the "muscular image" of Russian Prime Minister Vladimir Putin and there may be an increase in the number of police raids on areas where Chechens concentrate in Moscow, the Reuters news agency reports. 0949 FSB Director Alexander Bortnikov says he believes the two devices contained the explosive hexogen (also known as RDX), as well as chipped iron rods and screws. 0943 Amateur video footage has emerged apparently showing the aftermath of the first explosion to hit Moscow's Metro system, at Lubyanka station. Earlier reports suggested this material had been recorded at the scene of the second blast at Park Kultury station. The BBC cannot verify the content of this amateur footage. 0937 Accountant Alan Broach, who was on the underground when the second bomb went off, emails: "The Metro was complete chaos and there was fighting. People believed that people from the Caucasus were responsible so they were beating them. In the end I walked 40 minutes to get to a different Metro station. We are still checking to see whether all our employees are OK. The atmosphere is suspicious and nervous and no one wants to stand near a Muslim looking woman. People are baffled as to why this is happening now." 0932 The BBC Russian Service's Yuri Maloveryan at Lubyanka station says traffic is now flowing, but the square remains closed to pedestrians. He says there are reports of informal taxis charging thousands of roubles - up to 4,000 roubles (£90) - for a fare that would normally cost 150 roubles - to get people to where they want to go. 0919 The BBC's Richard Galpin in Moscow says: "The Russian authorities have told us more than 70 people have been injured - among them are children. The latest figures from the emergency services are 35 people are known to have been killed but it is likely these figures are to go up." 0917 Nato Secretary General Anders Fogh Rasmussen condemns the "unjustifiable attacks on innocent civilians", pledging his commitment to fight with Russia against terrorism. French Foreign Minister Bernard Kouchner had earlier condemned the attacks "with the utmost firmness" and assured Moscow of France's "complete solidarity". 0914 Natalia Naydenova from Moscow emails: "The metro is empty, everyone got out, people are afraid. At 0900 GMT there was a false alarm about a third explosion, I heard it on the radio. Then people started calling from this metro station in panic. People in Moscow are panicking. There are lots of psychologists on the radio trying to calm people down, asking us not to panic, just to call our relatives." 0910 Alexander Bortnikov, the head the FSB (Russia's security service), says preliminary findings suggest the attacks were organised by a North Caucasus group. 0905 Security expert Victor Mizin, whose wife was on one of the trains attacked, tells the BBC: "Russia opposes a very tough enemy and it comes from our North Caucasian region but still it's an ongoing process and unfortunately the security forces are unable to quell it. And probably we should be vigilant and probably we've slackened, and we've been complacent in the recent years, when the terrorist threat has subsided." 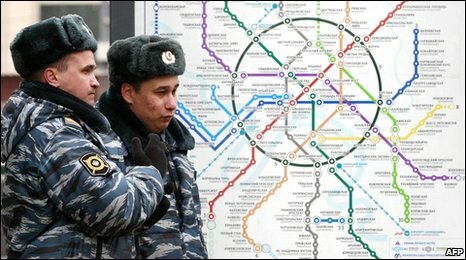 0902 Russian President Dmitry Medvedev orders security to be stepped up on transport networks across the country, adding that Russia will "fight terror without hesitation until the end". 0853 Evgeniy in Moscow emails: "The metro train carrying us got stuck in the tunnel for some time. The phones of the people around started calling with relatives asking whether we were all alive. When I got above ground I saw emergency vehicles and helicopters all moving towards Lubyanka. People around my station were desperately trying to call friends and friends many with tears and fear in their eyes." 0841 Vitaly from Moscow emails: "I was in the central part of Moscow metro. There was an announcement that there was an accident on a metro line where Lubyanka station is situated. Moscow emergency services reacted very fast to the accident - they started to inform people straight after the explosion and tried to redirect passengers traffic in metro to avoid crowds and crams. I saw no panic." 0834 In the aftermath of the attacks, more than 700 troops and police officials are patrolling the centre of Moscow, says Interior Ministry official Colonel Vasily Panchenkov. 0830 Olga from Moscow emails: "The underground is closed, the whole city is a mess, people are calling each other, the operators can't cope with such a huge number of calls at a time. I was in the underground this morning. Thank God, I didn't see the blood. I only saw huge crowds. People in trains and on the platforms are herrings in the tin. Many couldn't reach schools, universities, work... Those who witnessed the tragedy can't get over the shock." 0826 Russia's civil aviation regulator has ordered all local airports to increase security after the attacks, a spokesman for the regulator tells Reuters news agency. 0821 The BBC Russian Service's Yuri Maloveryan at Lubyanka station says there are still ambulances on the scene although all the wounded have been transported to local hospitals. 0818 The combined power of the two blasts is estimated at 3kg of TNT, specialists from the country's Anti-Terrorist Committee say. 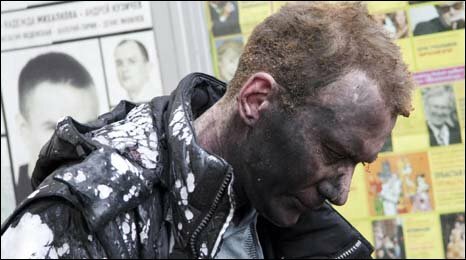 0811 The BBC's Richard Galpin in Moscow says: "So far no individuals or organisations have said they were responsible for the bombings. But previous suicide attacks carried out here in Moscow have been blamed on Islamic rebels fighting for independence for the Russian region of Chechnya." 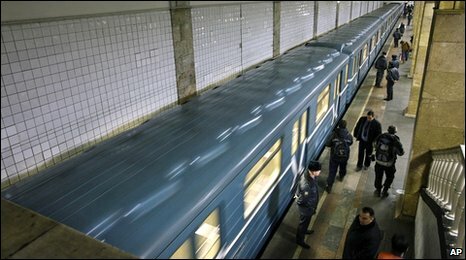 0753 Two bombs at the height of rush hour on Moscow's Metro system have killed at least 37 people. Russian officials say female suicide bombers set off the blasts within an hour of each other. More than 20 people died in the first bombing, as a train was standing at Lubyanka station, beneath the headquarters of Russia's main intelligence agency, the FSB. 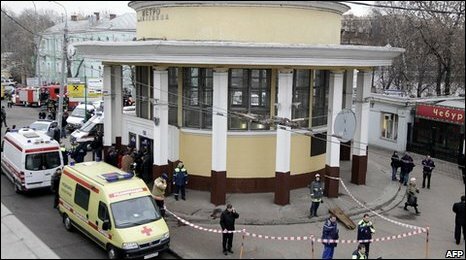 The second bomb was on a train at Park Kultury station. Can underground travel be safe?